We just can’t pass up a good renovation story, so when we had the chance to visit the home of Ashlee and Jeffrey Santerre on Chelmsford Road in Bedford and saw the transformation from when Suzanne and Company sold it to them six years ago, we thought it would be great to share both the story and some of the before and after photos with our readers. New siding, updated landscaping, a new entry way, and bright door to a renovated breezeway provide a fresh and modern touch. When Ashlee and her husband began their search for a forever home in 2011, they knew that they wanted to find a home in a close-knit community with good schools and a large yard. They ultimately selected Bedford, well-known for its excellent school system, easy commute to Boston, and community spirit. With the town selected, they next had to find the perfect home. Lucky for them, Suzanne & Company had a beautiful Colonial on the market! One visit and they knew that this was the home they had been searching for. Although the home had many modern updates, Ashlee missed the special personal touches she had in her previous home – a restored Victorian. She knew that with a plan, some patience, work, and reassurance from her husband that they would “make it their own”; they could transform this house into a home. Over the course of five years, they have worked through the interior and exterior of the house to create what can only be described as a personal oasis. With a clear vision, Ashlee and her husband laid out their plan. Work began on the exterior of the home by adding new siding, a new roof, and updating the breezeway, giving them a much-needed mudroom. From the mudroom, they expanded into the backyard to create an addition for a home office and a large, sunny family room. 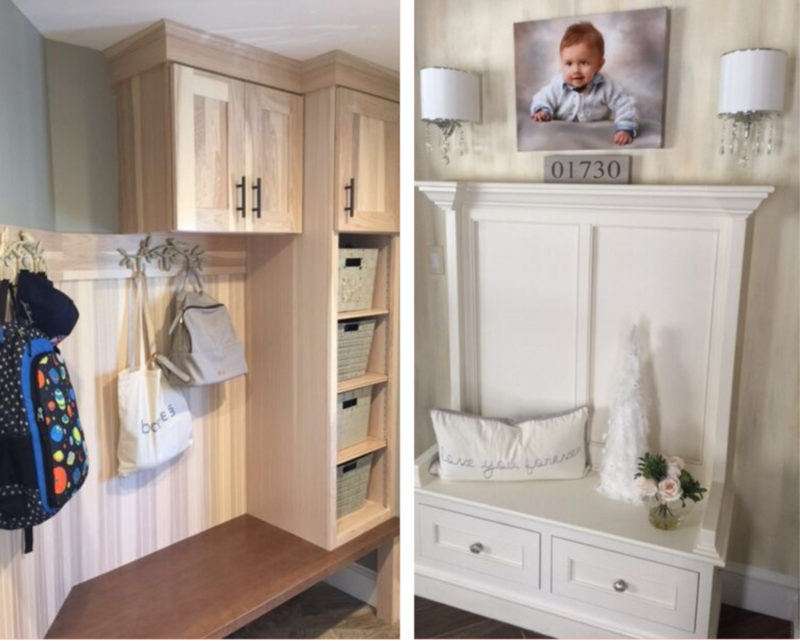 With the storage gained by creating the mudroom, she chose to take out the coat closet by the front door and replace it with a built-in bench, a perfect entry for a busy family. The bathroom and the kitchen got new fixtures, finishes, and appliances. Ashlee worked with designers on the overall layout of both rooms, while choosing tiles, counters, and cabinets herself. Moving the washer and dryer to the basement created space to expand the shower area and add storage for linens and toiletries. The open dining area got special treatment with silver travertine stone installed on the front accent wall. After getting a quote from a local supplier that seemed high to her, Ashlee researched it online, found a site with good reviews, and got it for a fraction of the cost, creating a custom look at a bargain price. The first floor underwent some reconfiguration, by tackling what Ashlee referred to as the “hall of doors.” They eliminated two of the doors, creating an opening onto the hallway, expanded the space and built a walk-in pantry and linen closet. With much of the work on the first floor done, it was time to tackle the kitchen. For eight weeks, they managed by cooking easy to prepare meals using the microwave or grill. Ashlee and her son had fun planning daily excursions to avoid being in a construction zone. This spring, they overhauled the dining room, where they replaced the popcorn ceiling with smooth plaster, installed a custom shiplap mantel, added the custom trim style used throughout the rest of the first floor and added a built-in hutch. They recently extended the custom trim to the stairs and into the bedrooms and 2nd-floor bathroom; they also upgraded the doors, and added a petite barn door to the hallway linen closet to break up another “hall of doors”. Removing a series of doors in a hallway allowed Ashlee to make better use of the space and build a walk-in pantry and linen closet. The upstairs bathroom got a new vanity, shiplap on three walls, a custom tile floor, and tiled shower surround and new faucets and fixtures. By keeping the same room layout, they saved on the cost of moving the plumbing. Ashlee has a flair for decorating, using unexpected materials and personal, homey touches. Ashlee shares, “I’ve always loved interior design and planning parties, so I started combing Pinterest and Houzz for inspiration.” With soothing colors, stencils, pictures and innovative furnishings, Ashlee has made this a home to be treasured for years to come. Ashlee's flair for design is evident throughout the home. Here a unique chair finds home in a corner and stencils greet visitors and remind the family how treasured they are. And they didn’t neglect the yard! They extended and leveled the yard, replaced all the fencing and moved it towards the back of the property, removed pine trees to open the space and bring in some more light. Additions include an outdoor kitchen, fire pit, in-ground pool, and pool house. A comprehensive landscaping plan is in place with new plantings of perennials, trees, shrubs, and woody plants spaced out over the next couple of years. The backyard is a welcoming oasis, providing Ashlee and her family and friends hours of entertainment and relaxation. Kaytlyn Constantinou at Design 1 Kitchen and Baths, Bedford, MA designed the layout for the kitchen and mudroom. Elise Stone, Concord, MA did all the drawings for the entire project. Our builder is Paul Marrone from Marrone Construction, Wilmington. Scott Howard of Howard Bros. Masonry & Landscaping, Woburn. Carol Leonesio of Paint It! who helped create stencils.